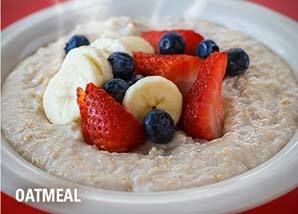 Simply the best around – it’s homemade! 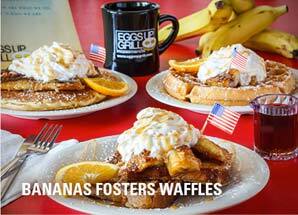 Two eggs served with our famous home fries or grits and toast. 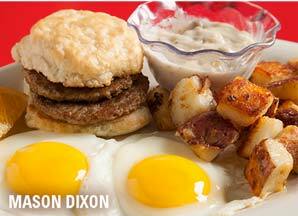 Two eggs with sausage patties, biscuit and gravy served with our famous home fries or grits. 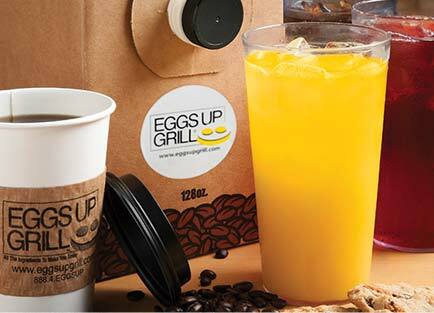 Two eggs with your choice of bacon or sausage and served with our famous home fries or grits and toast. 6 oz. 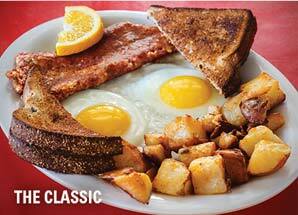 steak with two eggs served with a grilled Montreal tomato, garlic toast and our famous home fries or grits. 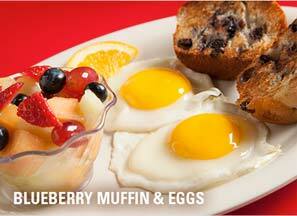 Two eggs with a golden grilled blueberry muffin and melon medley. Thick-sliced jalapeno cornbread toast, smashed avocado and fresh picante salsa served with two eggs. Two scrambled eggs, sausage, peppers, onions, sour cream and pepper jack cheese served with a side of salsa. 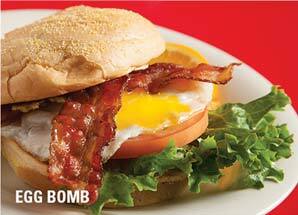 One fried egg, two slices of bacon, lettuce, tomato, and mayo on a grilled bun. Sausage patty, egg and cheese on a grilled biscuit with sausage gravy on the side for dipping. Choice of bacon, ham or sausage with two eggs and cheese on your choice of potato roll, biscuit, English muffin, toast, bagel or wrap. 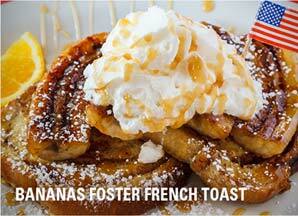 Served with our famous home fries or grits. Two poached eggs over Canadian bacon on an English muffin with Hollandaise sauce. 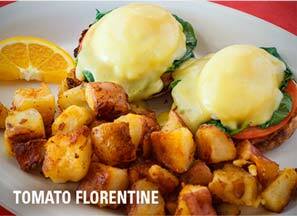 Two poached eggs set atop tomatoes, spinach and English muffins with Hollandaise sauce. 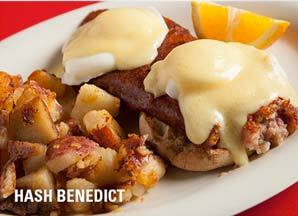 Two poached eggs over our corned beef hash on an English muffin with Hollandaise sauce. 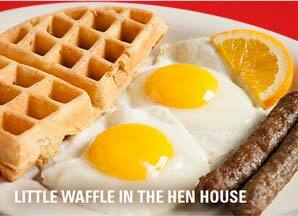 Prepared with farm fresh eggs* served with choice of famous home fries, grits or fresh fruit and toast. Egg white omelet with spinach, onions, mushrooms and feta cheese topped with sliced tomatoes. Spinach, feta cheese, tomatoes and black olives. 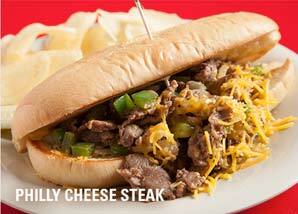 Thinly sliced steak with American cheese, onions and peppers. Grilled corned beef hash with melted Swiss cheese folded into the omelet. You pick whatever you like and we’ll fix it for you! 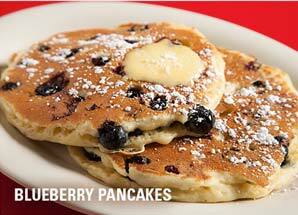 All “From the Griddle” items served with choice of bacon or sausage. Substitute country or city ham. Two pancakes sprinkled with powdered sugar. Two pancakes with creamy cinnamon syrup and sprinkled with powdered sugar. Two buttermilk pancakes with choice of: chocolate chips, blueberries, bananas, praline pecans or granola and powdered sugar. Two gluten friendly pancakes sprinkled with powdered sugar. Two slices of our famous Cinnamon Swirl bread dipped in custard, sauteed and sprinkled with powdered sugar. Choice of: chocolate chips, praline pecans or granola and powdered sugar. 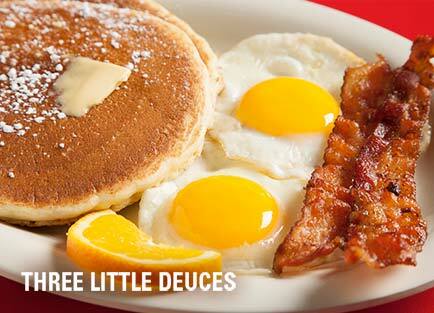 Two buttermilk pancakes, two eggs and choice of bacon or sausage. 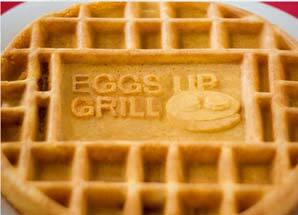 Half waffle, two eggs and choice of two bacon or sausage. 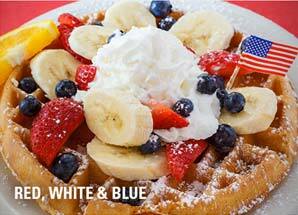 Strawberries, bananas and blueberries topped with a dollop of whipped cream. Your choice of two pancakes, a waffle or two slices of French toast, topped with sautéed banana slices, caramel sauce and a dollop of whipped cream. 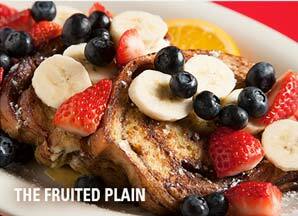 Two slices of French toast with fresh strawberries, bananas and blueberries topped with a dollop of whipped cream. Two slices of French toast, bacon and home fries. 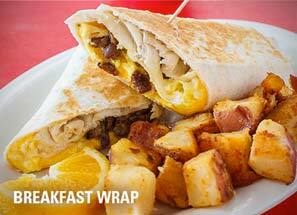 Our famous home fries covered with cheddar cheese, onions, peppers and bacon. Our famous home fries covered with cheddar cheese, onions, peppers, and sausage crumbles. 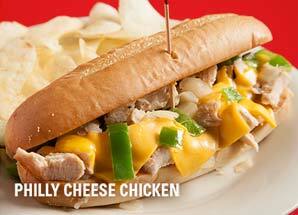 Our famous home fries covered with cheddar cheese, onions, peppers, diced ham, jalapenos and salsa. Cinnamon, brown sugar, raisins and granola. 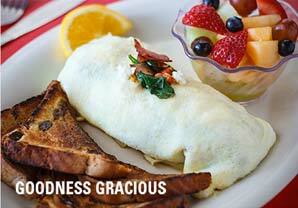 Egg white omelet with spinach, mushrooms, tomatoes, turkey bacon and feta cheese served with fresh fruit and toast. 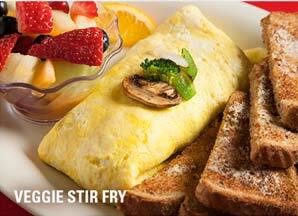 Sauteed broccoli, mushrooms, peppers, onions and tomatoes served with fresh fruit and toast. All handhelds are served with our famous home fries, potato salad or chips and a pickle. 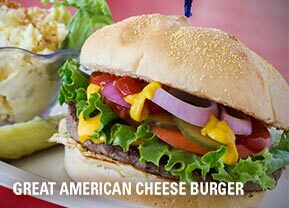 A Black Angus burger with American cheese, lettuce, tomato, red onions, mustard, ketchup and dill pickles on a grilled bun. A Black Angus burger with bacon, cheddar cheese, red onions, mustard, ketchup and dill pickles on a grilled bun. A Black Angus burger with pimento cheese, bacon-onion marmalade, lettuce, tomato and a fried egg served on thickly-sliced jalapeno cornbread. 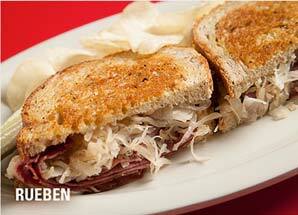 Corned beef served on grilled rye bread with Swiss cheese, sauerkraut and 1000 Island dressing. Sliced turkey, bacon, Swiss cheese, lettuce, tomato, avocado and mayo on grilled Tuscan bread. 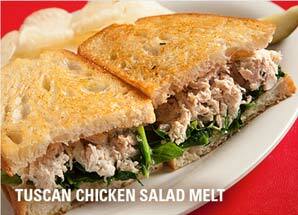 Homemade chicken salad with sautéed spinach and melted Swiss cheese on grilled Tuscan bread. Piled high with bacon, lettuce, tomato and mayo on grilled Tuscan bread. Grilled chicken breast with lettuce, tomato, avocado, red onion and ranch dressing on the side. Turkey, ham, egg, bacon, lettuce, tomatoes and mayo served on your choice of toast. Bowl of soup with your choice of a half BLT or Club Sandwich. Cup or Bowl. Served with crackers. Diced chicken breast, mixed greens tossed in blackberry peppercorn dressing with pralines and feta cheese crumbles. 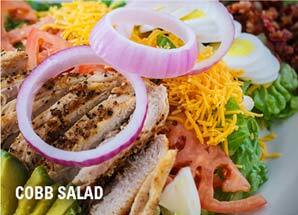 Mixed greens, bacon, avocado, red onions, tomato, boiled egg, grilled chicken breast, and cheddar cheese. Spinach, boiled egg, fresh strawberries, pralines, red onions and feta cheese tossed with our hot bacon dressing. 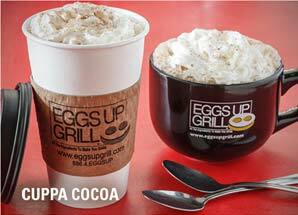 A blend of our house brewed coffee with our gourmet Cocoa topped with whipped cream. Consuming raw or undercooked meat, poultry or eggs may increase your risk of food borne illness, especially with certain medical conditions. We offer gluten friendly items, however our kitchen is not a 100% gluten free facility.